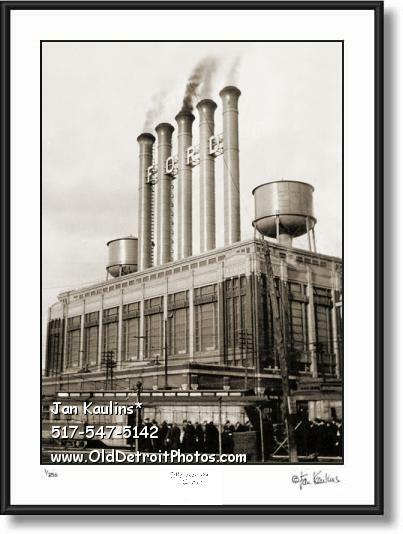 FORD MOTOR COMPANY HIGHLAND PARK Power Plant Factory black and white photo print photograph for sale. This sepia toned FORD MOTOR COMPANY HIGHLAND PARK POWER PLANT FORD FACTORY photo print photograph is made from a restored original black and white stero view card photograph. It shows the tall Ford Factory smoke stacks with the large bold FORD emblazoned across them and visible for many miles around. It is a wonderful image taken during the early years of The Ford Motor Company Highland Park Factory Power Plant in this vintage automotive historical photo print for sale. A small crowd of workers is seen walking on the sidewalk in front of this historic structure. Henry Ford built the orignal Piquette plant in 1904. In 1910 this Highland Park plant opens where assembly of Model T transferred from Piquette, which closes. This image of the historical Highland Park Ford Factory photo print for sale offered here is from 1917, almost 100 years ago!